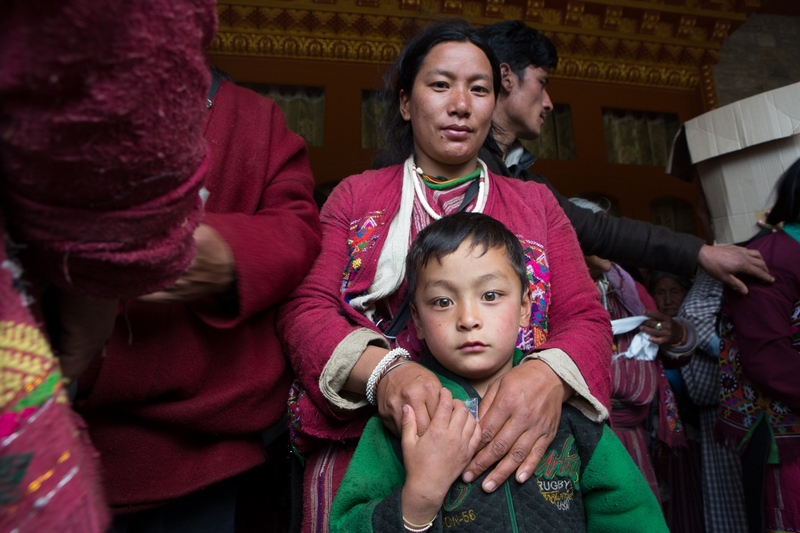 The Tibetan diaspora and modern technology are changing Tibetan Buddhism. Thupten Rinpoche, a high-level lama in the Gelug lineage, spent the last ten years building the Thupsung Dhargyeling Monastery in Dirang, India at the request of the Dalai Lama. 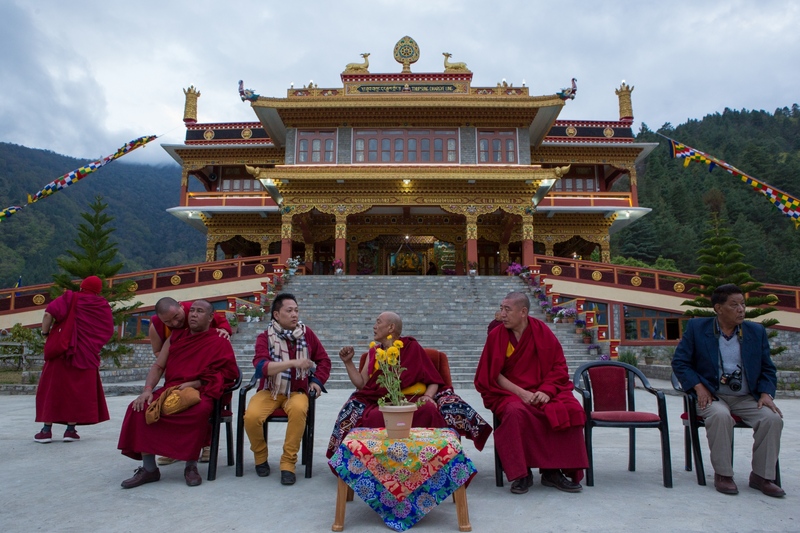 This monastery is intended to be a center of Buddhist study and practice for laypeople, to re-connect them with their culture and spiritual traditions. As a student of Buddhism, I have spent a great deal of time at Thupten Rinpoche’s temple in Los Angeles. 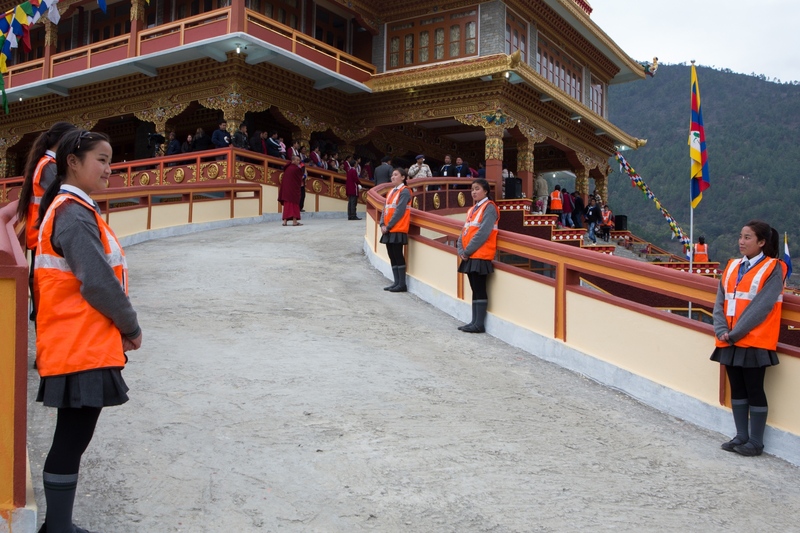 I traveled to Dirang to participate in the consecration ceremony at Thupsung Dhargyeling and immersed myself in the daily life of the monastery – sleeping there, eating and praying with the monks and local practitioners. I am fascinated with the Tibetan Buddhists’ steadfast preservation of their culture and traditions and how that intersects with influences from western cultures, as well as their infatuation with modern technology. 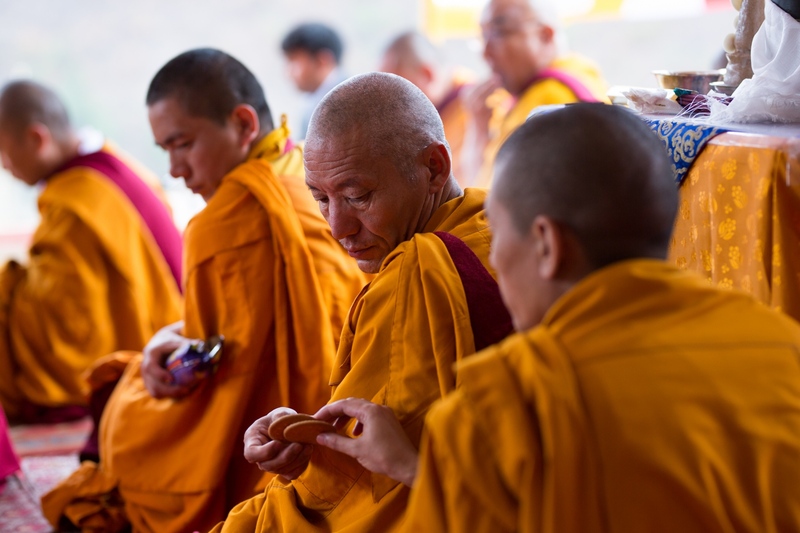 Maintaining religious authenticity is a priority for the preservation of Tibetan culture, but the idea of impermanence is the foundation of Buddhist teachings – they believe that our fears and attachments cause suffering in this always-changing world. This body of work explores the juxtaposition of tradition and modernity as the monastery prepares for a visit from their most sacred religious leader, the Dalai Lama. 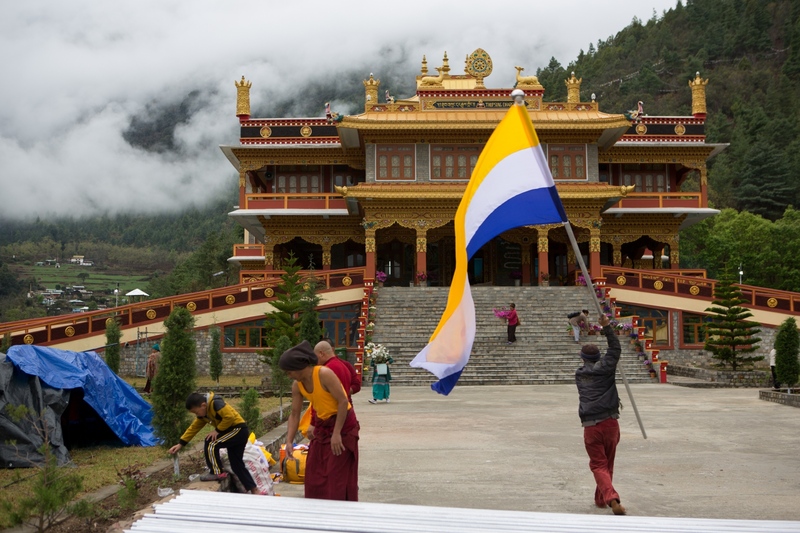 Monks and local volunteers place flags around the new monastery in preparation for a visit from the Dalai Lama. 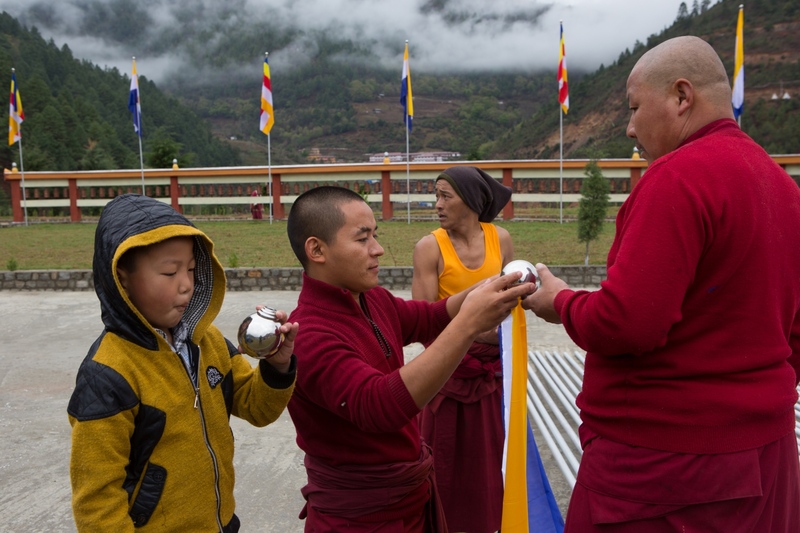 A young volunteer helps resident monks build flags and plays with his reflection in the flag-topper. 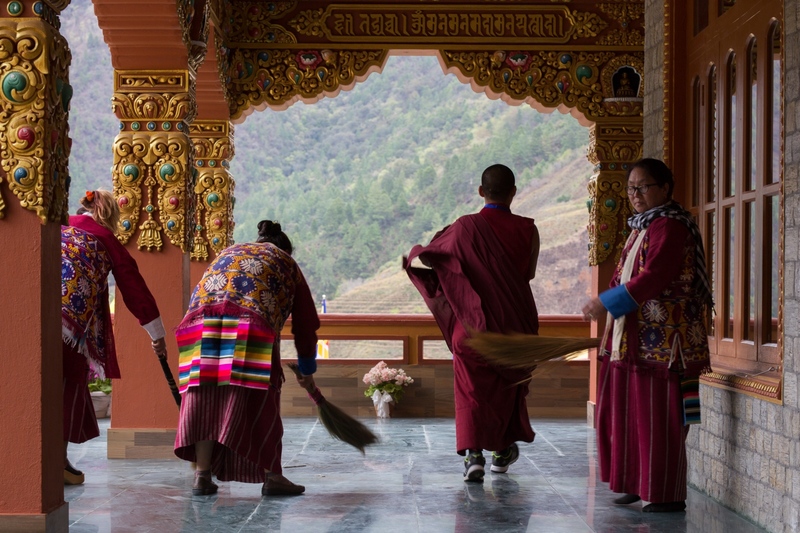 Local women sweep the temple veranda. 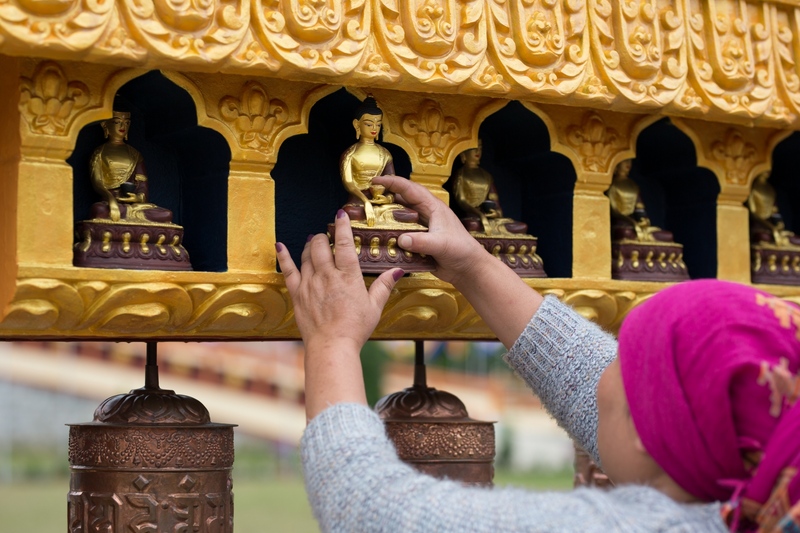 A woman places one of over 1,000 Buddha statues that decorate the monastery. Thupten Rinpoche's careful design ensured that you would be able to see Buddha no matter where you are on the monastery property. 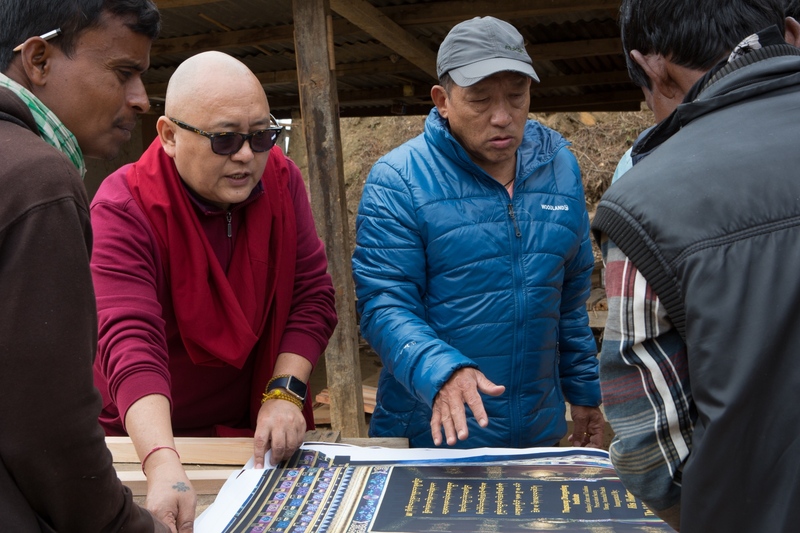 Geshe Lobsang Yarphel, Thupten Rinpoche's right-hand man, directs workers on how to frame a sign for the monastery's consecration ceremony. Geshe, with his Apple watch and Ray Ban glasses, organized a seminar on the preservation of Tibetan Buddhism in the Himalayas as part of the monastery's opening ceremony. He is also one of the monks at the monastery who is most passionate about new technology. 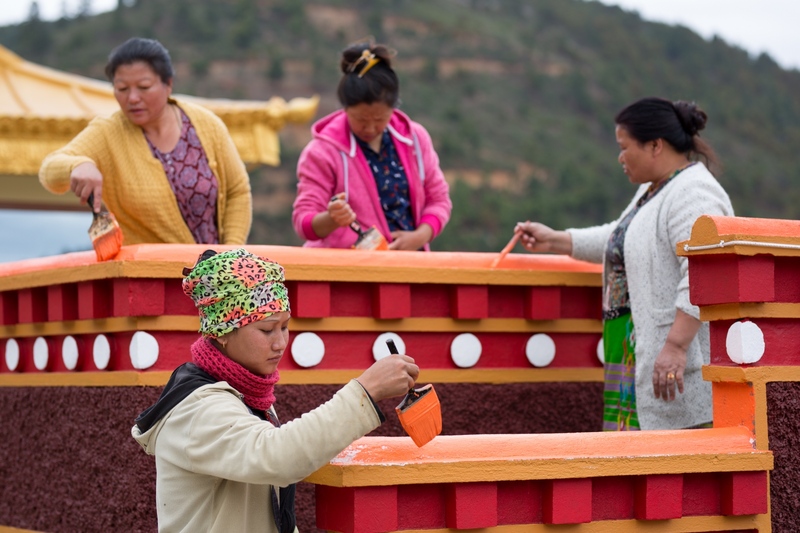 Volunteers put the finishing coat of paint on the monastery walls the day before the Dalai Lama is scheduled to arrive. Men make tormas, ritual cakes made from barley flour and butter. These tormas were dyed red using the root of a local plant. 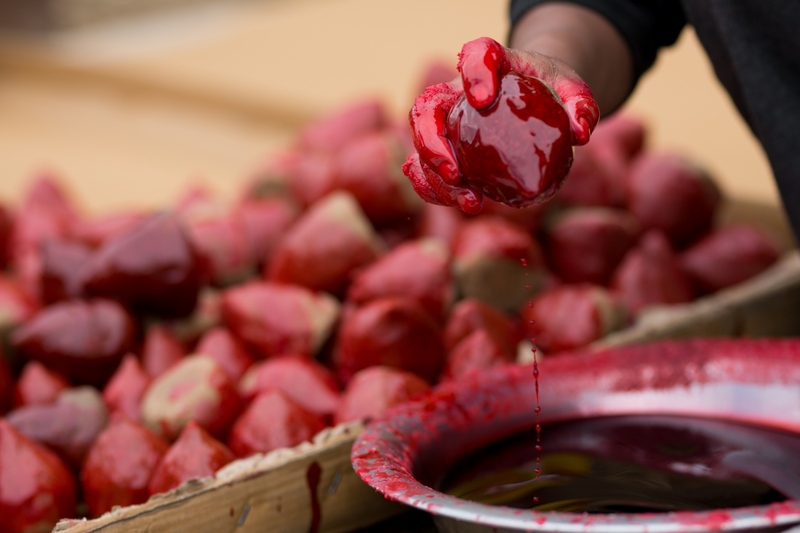 The red tormas are used in a tsok ceremony, a day when practitioners gather, make offerings, and say prayers to reaffirm their connection to their Buddhist practice. 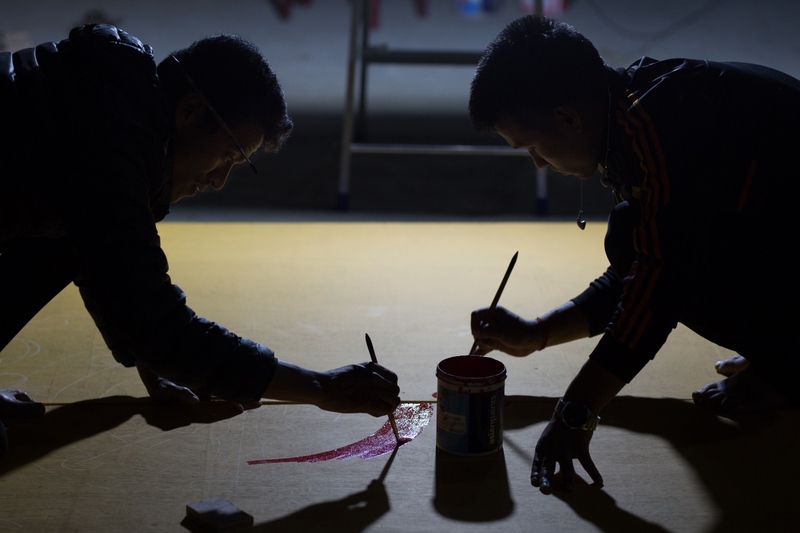 Professional temple painters Tenzin (left) and Passar (right) work late into the night to decorate a temporary structure that will be placed a four-hour drive up the road on a mountain pass, so when the Dalai Lama is driven through he will have a private rest stop. 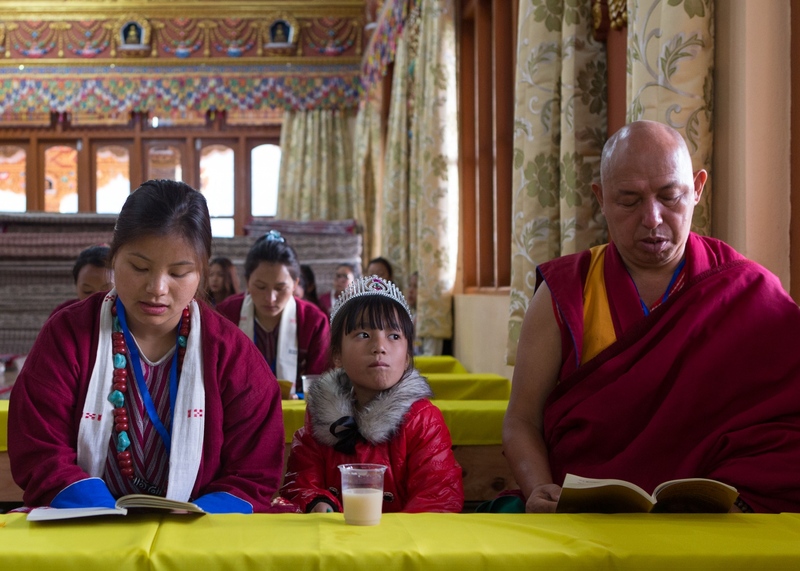 A young girl in a plastic tiara patiently drinks tea as her mother and a visiting monk chant during the morning prayers. Teenagers from the nearby English-language high school standby, anticipating the arrival of the Dalai Lama. The Dalai Lama is escorted to his seat by his attendant, Tenzin Penjor (right), and Thupten Rinpoche (left), before addressing the crowd. 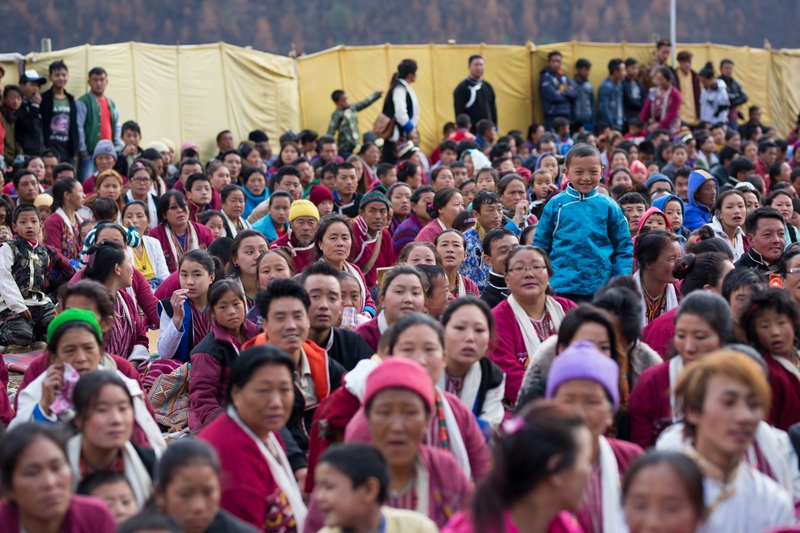 Devotees gather early in the morning, waiting hours for the Dalai Lama's teachings. The Dalai Lama holds up a prayer book during his teaching. High level monks and political officials sit on the platform with him, while devotees from near and far spread across the lawn below. 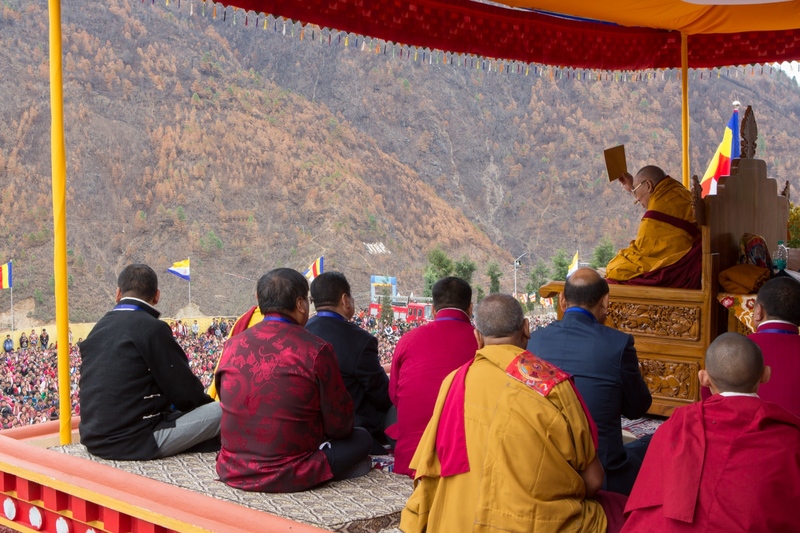 High level monks flanking the Dalai Lama during his public teaching at Thupsung Dhargyeling Monastery. 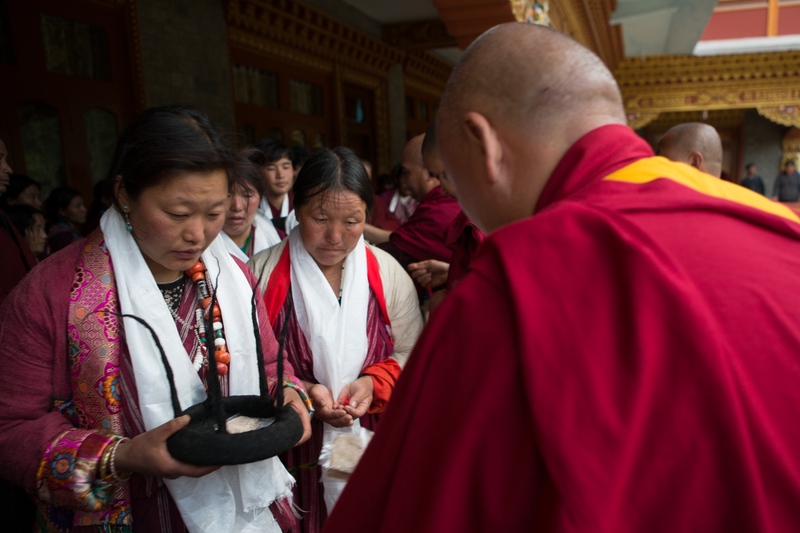 They pass biscuits that are eaten in ritual as part of His Holiness's blessing. An estimated crowd of more than 20,000 people wait for the Dalai Lama. 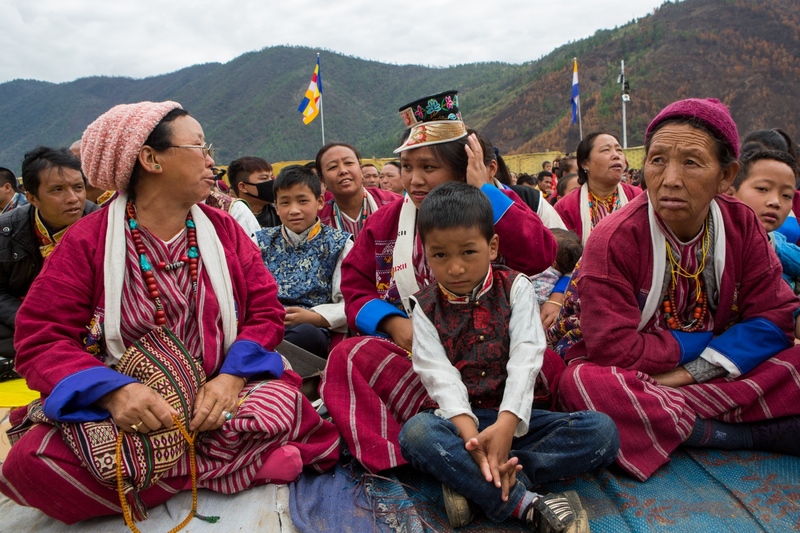 Pilgrims from Merak, Bhutan, a village very close to Thupten Rinpoche's birthplace, come to Thupsung Dhargyeling to see the new monastery. Thupten Rinpoche meets with a group of pilgrims who have traveled from Merak, in eastern Bhutan, a village very close to the his birthplace. They brought offerings of rice, butter, and money. 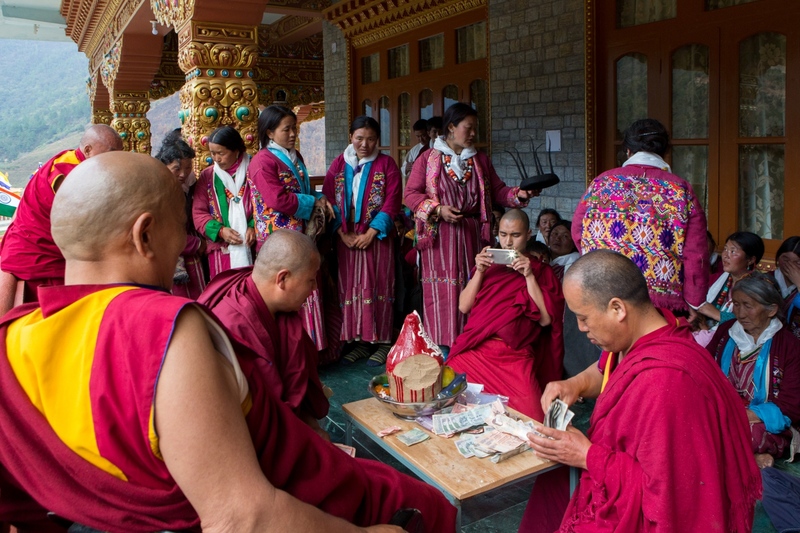 One monk documents the occasion on his phone, another counts the donated money, while the pilgrims wait to receive a blessing from Rinpoche. Two women from Merak, Bhutan, bow their heads after receiving blessed khatas, Tibetan prayer scarfs, from Rinpoche. The women on the left holds a traditional hat made of wool. 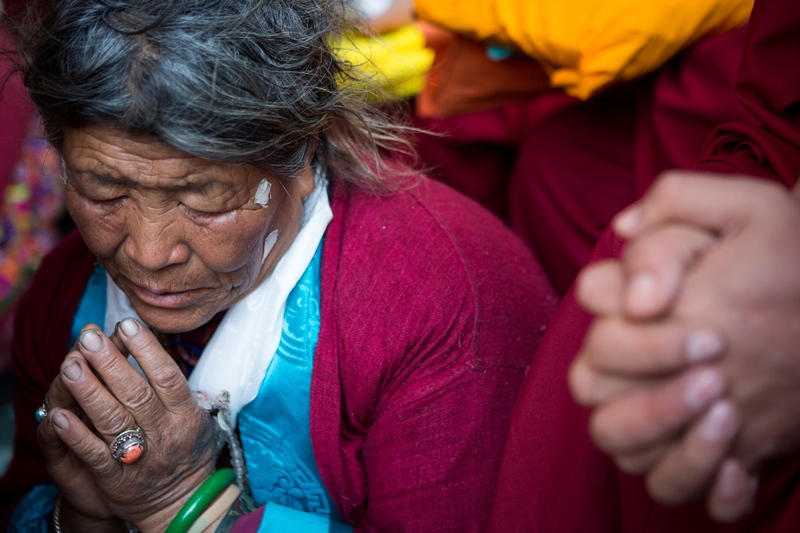 An elderly woman from Merak prays as she sits with Rinpoche and other resident monks. 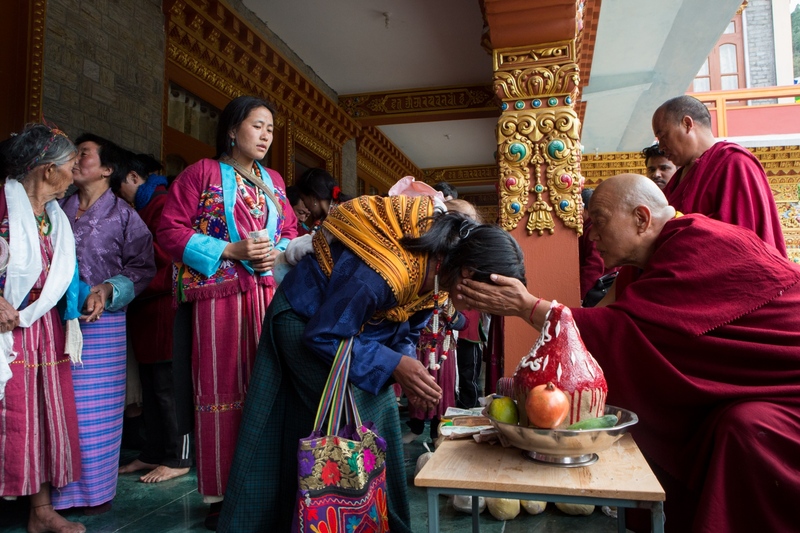 Thupten Rinpoche bestows blessing onto pilgrims who have traveled from Bhutan to see him. Thupten Rinpoche (middle) sits in front of the monastery with Tenpa Tsering (to left, in Burberry scarf). Tsering was a former high-level monk, believed to be a reincarnated lama, who left the monastic life. 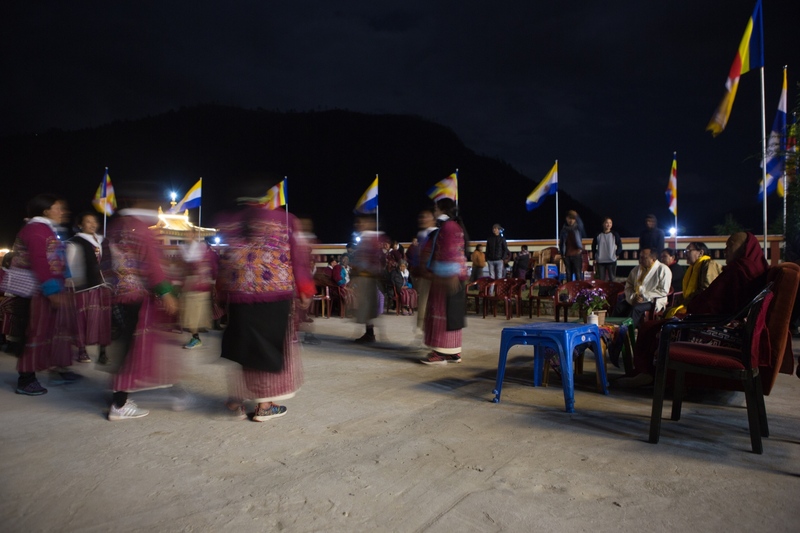 Pilgrims from Merak, Bhutan perform traditional dances late into the night to honor Thupten Rinpoche. 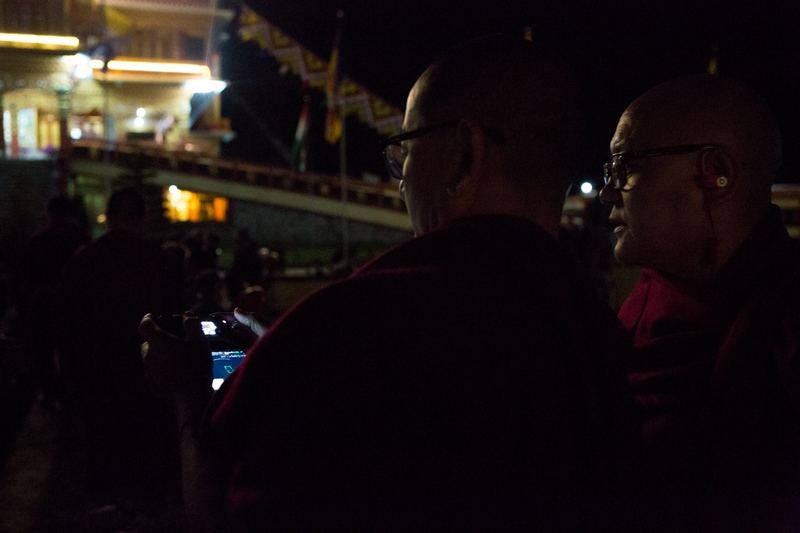 Monks Wangdu Tenzin Thokme (left) and Geshe Lobsang Yarphel (right) operate a drone to film the Merak dance performance in front of the monastery. 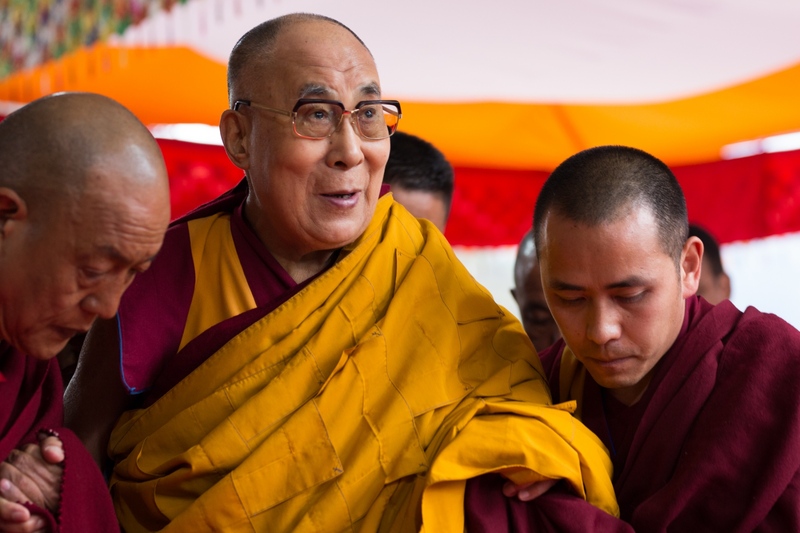 Every Tibetan Buddhist monastery has a special room reserved for the Dalai Lama when he visits. 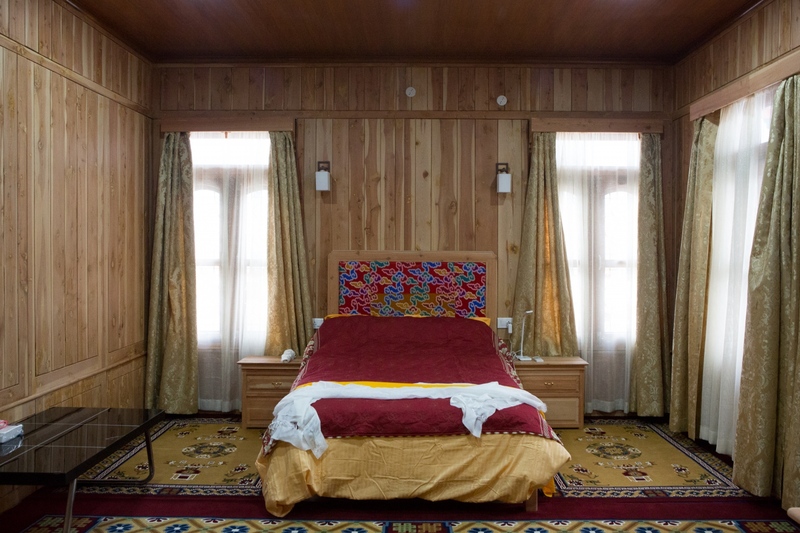 This is the Dalai Lama’s bedroom at Thupsung Dhargyeling, where everything is kept exactly as the Dalai Lama left it.